Is this your year to introduce the family to the pleasures of winter recreation? Make your dream a reality by participating in the Dream Big Ski Vacation in Aspen/Snowmass, Colorado. This trip giveaway is being offered by partners TravelingMom.com, Family Travel Forum and Taking the Kids with Ski.com. Five (5) nights in a two-bedroom condo at the Capital Peak Lodge, just steps from the Village Express high-speed lift and sky cab in Snowmass Village. On-site amenities at Capital Peak include the Treehouse Adventure children’s activity facility and Snowmass Club pools, hot tubs and spa services. The lodge also offers full service concierge, transportation within Snowmass Village, grocery pick up and delivery, wifi, washer/dryers and daily housekeeping service. This is the place to start your kids on a lifelong love affair with snowsports! The varied terrain is easy enough for the beginner, challenging enough for the fast and fearless, and offers plenty of middle-of-the-road turf in between. Your lift ticket allows you to ski four mountains connected by a free skier shuttle. This Dream Big Ski Vacation includes two (2) adult and two (2) children's lift tickets (ages 2.5 – 12 years old) for three (3) days, valid at all four Aspen/Snowmass mountains: Snowmass, Aspen Mountain, Aspen Highlands and Buttermilk. Snowmass has excellent learning programs for toddlers and preschoolers and a highly regarded Aspen/Snowmass Ski & Snowboard School for kids and teens. Enroll your children ages 2.5-12 in two full days of ski or snowboard lessons (children are taught in age-appropriate group lessons) while you enjoy the slopes and some adventure time together. On the third day of your ski vacation, hit the slopes with the kids and see how much they’ve learned! The Dream Big Ski Vacation also includes three (3) days of ski or snowboard equipment rentals for two adults and two children. After a good night’s sleep, you can arrive early at the Snowmass Equipment Rental Shop, where experts will fit your family for skis or snowboards, boots, and any necessary gear and helmets. After three days on the slopes you’ll be ready for a day off with someone (or some thing!) to do all the work of getting around! Your family can spend a day together exploring the terrain on an unforgettable two-hour Krabloonik Dog Sled Ride through the pristine Snowmass/Aspen wilderness. 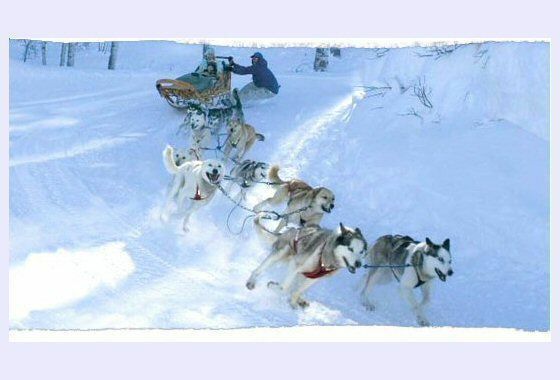 Each sled, which can carry two people, is pulled by 10 Alaskan sled dogs and guided by an experienced musher. The sled dogs are born and bred to run and they love the thrill of the run just as much as the riders do. Your family can choose between three departures: The morning and afternoon dog sled ride includes a three-course gourmet lunch served in a private room at the world-class Krabloonik Restaurant. The twilight dinner ride is an excursion through a still, snowy Snowmass wonderland and includes a four-course dinner at the Krabloonik Restaurant. And thanks to Ski.com, there’s still time to explore all that downtown Aspen has to offer, including art galleries, special boutiques and some of the best ice cream this side of the Rockies. The Families Dream Big Ski Vacation promotion is open for entries from November 21, 2011 to Monday, December 19, 2011 at midnight, ET. Please note that winners are responsible for their own transportation to Aspen, Colorado as well as other expenses for food, any products, personal needs such as laundry or spa treatments, and other expenses not specifically included in the above prize description. The estimated retail value of this prize is US$10,000 and winners will be solely responsible for any and all taxes due for the prize. Additional family members and children over age 12 may be accommodated for a fee. Restrictions may apply. This prize package is redeemable any time during the 2011-2012 snowsports season at Aspen/Snowmass, based on availability. Travel must be completed by the end of the 2011/2012 season as defined by Aspen/Snowmass. Winner will be chosen by random.org from among entries on all three sites, TravelingMom.com, Family Travel Forum (see Details on Entering the Families Dream Big Aspen Ski Vacation Promotion) and Taking the Kids. One semi-finalist will be chosen from each site, then the grand prize winner be chosen from among those three semi-finalists. Please see the Rules page for more information and an explanation of how to enter.